• Connects directly to hard-wired camera. • Min 100m transmission distance at open site. 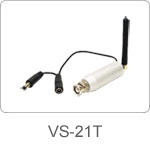 • Powered via camera directly(12VDC).